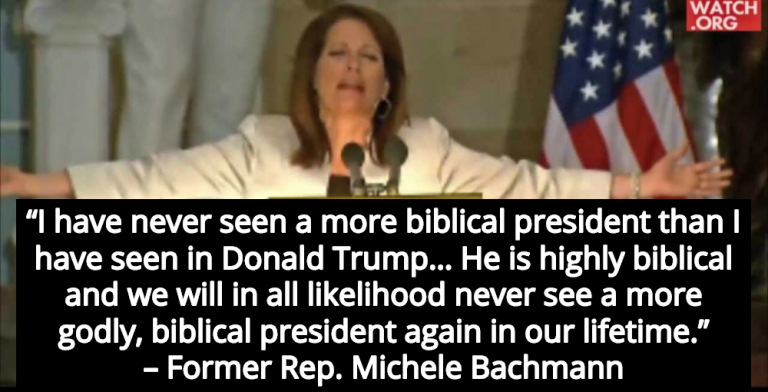 Former congresswoman and Christian extremist Michele Bachmann claims she’s never seen a more “godly” or ‘biblical” president than Donald Trump. I will say to your listeners, in my lifetime I have never seen a more biblical president than I have seen in Donald Trump. He has so impressed me in what he has done, and we haven’t even talked about Israel. What he has done to advance Israel. He is highly biblical and we will in all likelihood never see a more godly, biblical president again in our lifetime. So we not only need to be praying for him, we need to support him, in my opinion, in every way that we can. More recently, Evangelical leaders have been pushing Trump to name Bachmann as the next ambassador to the United Nations. claimed that God uses terrorist attacks to humiliate President Barack Obama.